Discover the joy, the beauty, the adventure of a single amazing day on earth. From BBC Earth Films, the studio that brought you Earth, comes the sequel - Earth: One Amazing Day, an astonishing journey revealing the awesome power of the natural world. Over the course of one single day, we track the sun from the highest mountains to the remotest islands to exotic jungles. Breakthroughs in filmmaking technology bring you up close with a cast of unforgettable characters. 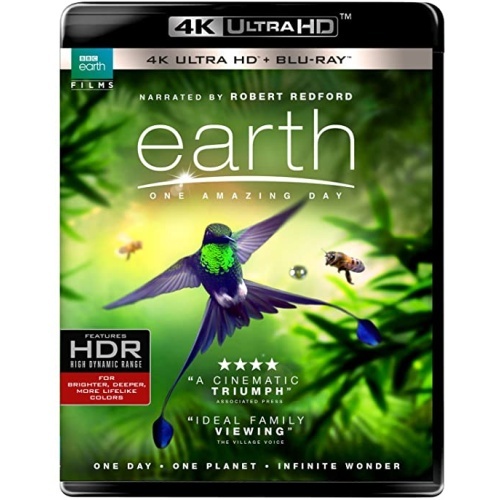 Told with humor, intimacy and a jaw-dropping sense of cinematic splendor, Earth: One Amazing Day highlights how every day is filled with more wonders than you can possibly imagine - until now.